Nokia is said to launch a couple of high-end devices in coming months, two of which are said to be the Nokia 8 and 9. The Nokia 9 leaked via the hands-on images and camera samples a few weeks back that gave us the very first look at the device. Today, the phone was spotted on the benchmarking platform, AnTuTu, that reveals the major specifications of the device. 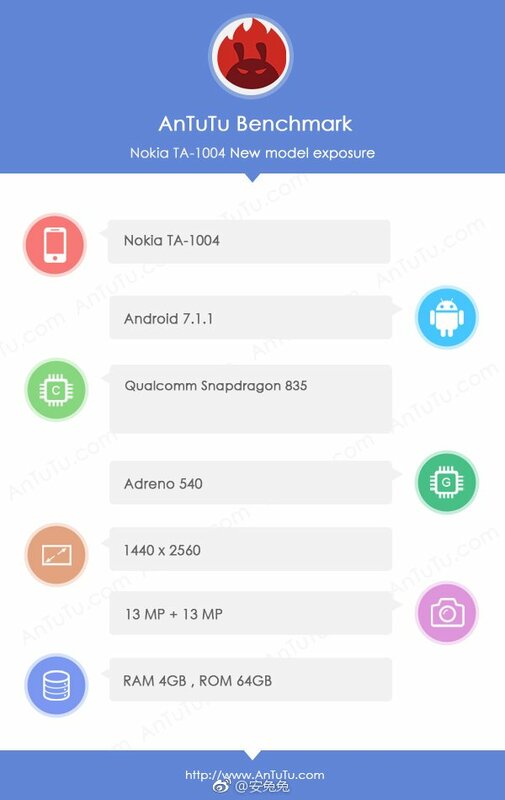 The phone has appeared on AnTuTU with the model number Nokia TA-1004. Well, it packs the high-end specs that we can expect to see on a premium high-end device. The phone runs on Android 7.1.1 Nougat out of the box and is powred by the latest and the fastest Snapdragon 835 processor with Adreno 540GPU. As revealed before, the phone has a 5.3-inch display, with a resolution of 1440×2560 i.e a Quad-HD (2K) display and 557ppi pixel density. There is 4GB of RAM with 64GB internal storage space. The phone features dual rear camera setup with 13+13MP sensors on the back. Well, nothing so surprising in terms of the specifications as these have already leaked via the hands-on shots of the smartphone. It will be interesting to see the AnTuTu Benchmark Scores of the Nokia 9 and how it competes with the best phones available right now in the market. So, what are your opinions about the specifications? Do let us know via the comments section.